How well do you understand food labels? Clients are always asking me in our Facebook group if they can have certain food products, condiments, spices, etc. 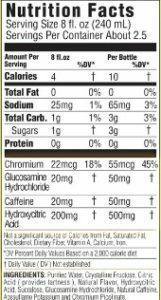 You can quickly figure this out by reading the ingredient LABEL (first) and the nutrition label (second). Always keeping in mind the philosophy of, “if you can’t read it or pronounce it, don’t eat it”. In order to begin understanding food labels we must first realize that the food industry uses the metric system on the nutrition label. Many of us don’t know how to quantify a gram and translate it into a more familiar and usable measure. To make things worse, we don’t know how to judge how many grams might to be too much. If you see 64 grams on label packaging, you might not look at it as a big deal because as Americans we naturally think in calories. Since we are marketed those 100 calorie packs, we know the number 100 isn’t a big deal. But as you now know grams aren’t calories. And they can not be interchanged. So let’s look at a simple math equation that you will help you and your friends and family. If a product (let’s say a 16 oz. bottle of Sprite) says 64 grams of sugar, that equates to 16 whopping teaspoons of sugar!! Would you put 16 teaspoons of sugar in a 16oz cup of coffee?? And just a side note, Dr. Pepper has less sugar than Sprite. You would think that Sprite is more innocent because it’s clear. When reading this nutrition label, it really doesn’t look that bad. There is only one -1 gram of sugar, right? But look at the ingredients: Chicken Broth, Salt, Dextrose, Chicken Fat, Monosodium Glutamate, Hydrolyzed Wheat Gluten Protein, Natural Flavor, Water, Autolyzed Yeast Extract, Carrot Juice Concentrate, Mono and Diglycerides, Xanthan gum. Balsamic Vinegar # 1: Yes or No? Sobe Life Water: Yes or No? Skinny Girl Stevia: Yes or no? Rice Wine vinegar: Yes or no? Spice – Yes (notice, there is green bell pepper in this and you cannot have peppers, but it is so trivial that it isn’t a concern). Reading labels has to become a habit, so you can develop good shopping habits. Good shopping habits keep you on target to reach your goal. Remember you’re on a journey and your health is your goal. A goal that is worked on every day.